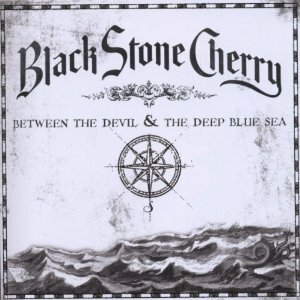 "Between the devil and the deep blue sea" is the third album from US rockers Black Stone Cherry. Their brand of Southern rock has been growing rapidly in popularity since they released their debut album back in 2007, and 2011 see's them touring the UK with Alter Bridge and playing the Hard Rock Hell festival in December. The album kicks off with "White trash millionaire", a track which is Black Stone Cherry at their best. "Such a shame" - the song title sums up my opinion on the song. You've got a song about death and suffering, but the song fails to deliver any emotion, and this lack of emotion just doesnt sit well with the lyrics. "Blame it on the boom boom" is one of the best tracks on the album. A great tune full of energy and some great guitar work with wah wah effects make this a song I can imagine played heavily on radio stations around the world. The varying amount of distortion and use of the wah wah effects help ensure that the guitar work throughout the album manages to feel varied while still keeping that Southern Rock feel. With this their third album, Black Stone Cherry have produced another great album packed with great songs. Well worth buying. The deluxe version of the album is the one to go for - with three extra tracks for almost no price difference, its an easy decision to make.